What better than to start the day discussing DESIGN? On January 20, 2017, a diverse group of designers, planners and architects gathered to discuss design and the state of design related to the homebuilding industry. 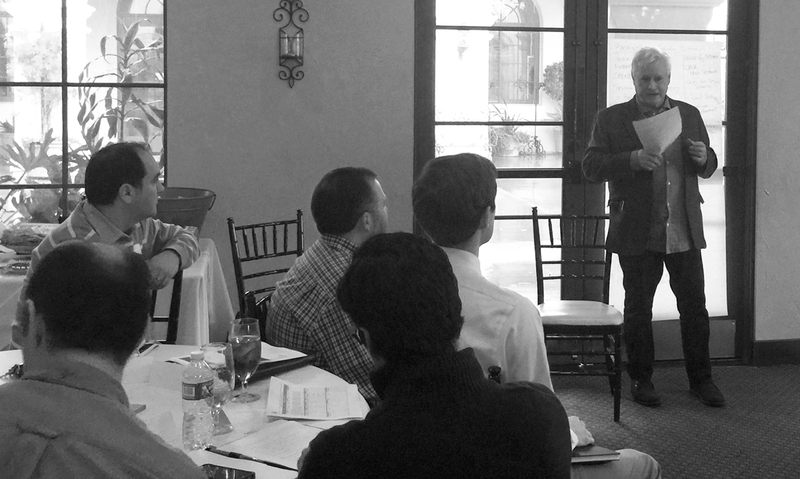 We were fortunate to have Pete Zehnder, founder and principal of Collective Housing Supply, as our guest speaker. We have successfully had the opportunity to collaborate with Pete on a few projects over the years. His unusual approach and unique background align to foster and develop creativity throughout the project. From designing and developing a skateboard company, to owning one of Los Angeles' most successful flower shops, Pete always brings a fresh perspective to his work. DAHLIN recently had the opportunity to work alongside Pete in developing the new home collection, Miraval, in the Mesa Verde neighborhood of Costa Mesa. Pete offered a different perspective in his approach to the design, branding and marketing of the developement. His views are shaped by his journey's through life and the experiences he has along the way. He is very passionate about design and is not one to be politically correct or sugar coat the truth, but to tell it like it is. He often draws inspiration not from architecture, but from other forms of media: shoe design, car design, graphic and logo design, and applies those concepts and ideas to his work. He recounted his inspiration on the Miraval collection, reminiscing on his own childhood, growing up in the 50s and his attraction to Mid-Century Modern architecture. Pete inspired, motivated and challenged us to think more deeply about design and the effect design has in all aspects of life. Inspired by a client that shares the same passion and creativity as we do in great design, this is the formula behind Miraval's success. Collaborative minds encourage, challenge and push for innovation. Round two of Miraval is underway on an adjacent property; expect great finds and continual emphasis on individuality which made Miraval such a hit. Design for Breakfast explores the most interesting trends in art, architecture and design. DAHLIN collaborates with leading designers, developers and industry professionals to share their work, ideas and thoughts on the emerging trends shaping the future of the built environment. These quarterly events are informative, engaging and interactive while offering diverse insight from the leaders who are making a difference.